Every year between July and August, my family and I take a summer vacation to Ocho Rios, Jamaica. 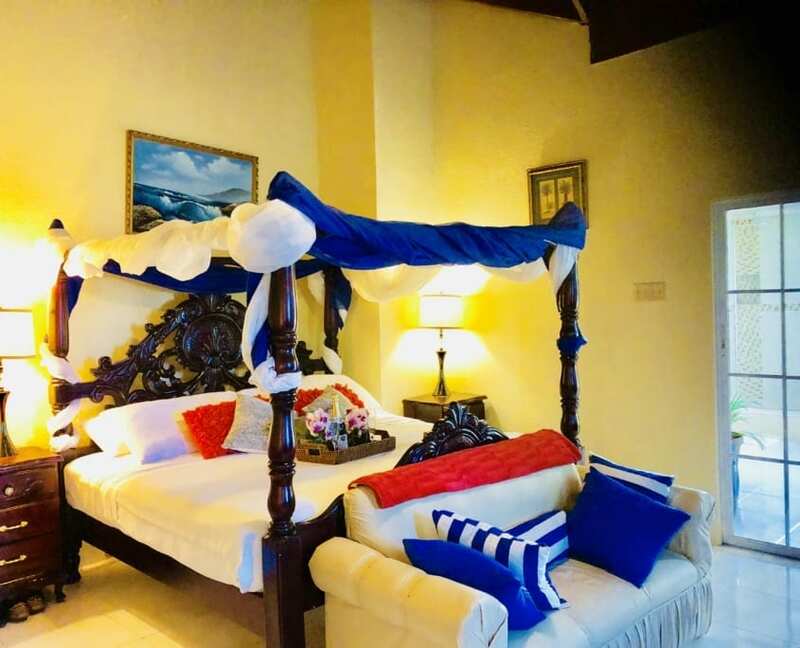 Our favorite place to stay is Villa Serenity, formerly known as Jamaica Ocean View Villa. Villa Serenity is one of Ocho Rios’ finest exclusive villas. It’s a magnificent upscale property that feels like a resort in itself and has an incredible assortment of services and amenities available with their all-inclusive deal. My favorite thing about this villa has to be the private staff. When you stay at Villa Serenity, you’ll be pampered by two gourmet chefs, a butler, housekeeper, groundskeeper, and bartender. Even the best resort on the island can’t top that kind of personal service. The house itself is exceptionally beautiful. There are a kid’s game table and other amenities for children, a pool table and a private bar. Outside on the manicured grounds, there’s a large pool with a lovely deck where you can eat whichever meals you choose to take outside. There are five vibrant decorated bedrooms in the villa. Each one is more amazing than the last. Heart-stopping views of the coast, ocean, tropical landscaping and mountains are enough to take your breath away, but it’s not hard to recover with flat screens, cable, AC and ceiling fans in every comfortable room. Just around the corner, a two-minute walk from the front door, there’s a private beach where you can soak up the sun or lounge in the shade without navigating through crowds of tourists. There’s also a majestic river that flows right out to sea next to the beach. It’s not quite property by the sea, but it might as well be, with everything Villa Serenity offers (which includes the ocean view of a beach-front property). If you’re looking for night-life, attractions, local eateries or local or international markets, your chauffeur is available for up to ten hours a day to take you wherever you need to go. It takes less than ten minutes to get downtown where the action is. Upon our arrival this last summer, our chauffeur met us at the airport. We stopped by our usual spot for lunch, Ultimate Jerk Center, on the way to the villa and had delicious Jamaican jerk chicken with Jamaican bread and festival. As is tradition, we drank Red Stripe Beer and Kola Champagne soda. When we got to the villa, the staff welcomed us warmly and offered mannish water soup and escovitch fish (We provided our menu choice prior to our arrival). The houseman took our luggage up to our rooms and we went to the pool deck, which is always immaculately-kept with fresh towels on the lounge chairs. The dining table on the deck was set and shaded by a beautiful palm and we could hear the tranquil sounds of the ocean as we sat and recovered from our travels with drinks from the bartender. The next morning, we woke to fresh Blue Mountain Coffee and a mixture of traditional Jamaican and international breakfast dishes. I had my favorite local breakfast, which is the ackee and saltfish with callaloo and johnnycakes, though sometimes I prefer the ackee and saltfish with Jamaican run-down. Dinner was also a mix of local and international cuisine, prepared by our gourmet chefs. One night, we had Jamaican rice and peas with oxtail in a luscious gravy out by the pool. We also had French fried chicken and potato salad prepared with a side of fresh veggies. Our entrees were paired with two proteins and a selection of starters each night. There were different soups and salads to try and we always had dessert. Some of our menu choices included jerk chicken, stew peas, fried chicken, jerk pork, curry lobster, lobster tails, grilled shrimp, escovitch fish, pork chops, steak tips, and parmesan chicken. As sides, we were offered choices like potatoes, seasoned rice, curry rice, past,a and linguine. No matter where you stay, you have to see some of the beaches in Ocho Rios, which are some of the best in Jamaica. Many are just a short walk from Villa Serenity. Bamboo Beach Club is famous among cruise ship, hotel and villa guests, as it’s only a three-minute drive away. It’s full-service, so you get amazing food, a beach bar, massage tables, health drinks, lounge chairs, a VIP area, music, and lively dancing. If you go in the evening or at night, you can catch dinner and live entertainment. There’s an entrance fee, but it’s low. About $10 will get you entrance, a lounge chair, and a server. Sugar Pot Beach is small, secluded and only a five-minute walk from Villa Serenity. Entrance is $2 and you can purchase food and drinks on the beach. There’s no charge for entrance to Mahogany Beach, where you can get into a whole range of water sports or just rent a lounge chair. Mahogany is only a five-minute drive from the villa. One of our favorites is the famous James Bond Beach, which is an eight-minute drive from Villa Serenity. At this nostalgic movie location, you’ll find brightly-painted changing rooms, a water sports center, a bar and a restaurant, as well as a low entrance fee. On this last trip, we went to several attractions. Our first full day on the island, we took the Chukka Cove transport to Good Hope in Trelawney. They picked us up at 7:45 a.m. right from the villa. 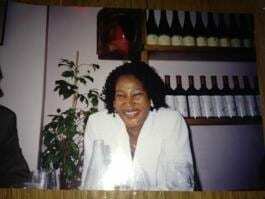 We first went to Sandals in Ocho Rios, then Riu Resort and a few others. After the last stop, the driver said we were about 30 minutes from Good Hope. We turned off the main road and headed towards the estate. This country road offered mesmerizing views of the pastures and mountainside. When we got to Good Hope, we were taken to meet the staff at the attraction site. After a brief intro and procedural advisory on clothing and lockers, we got the appropriate bracelets for our chosen activities. We got a locker for $5 and shared it. It was large enough to hold our towels and personal belongings that we didn’t want to tote around. At the information desk, we presented our bracelets and were given the schedule of activities. While we waited for our first activity, we were given complimentary water and a refreshing fruit punch. My teen daughter talked me into Thrill Seekers and Adventure Falls by saying something about quality time together. I’m not a thrill seeker at heart. I was quite content to drink punch in the shade and make conversation, but I fell for it and it was worth it. 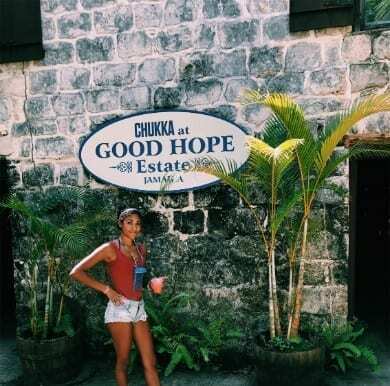 This adventure consisted of zip lining through the rainforest (four lines, total), river tubing, canoeing on the famous Martha Brae River and having our favorite jerk chicken and rice peas with Jamaican festival for lunch. The Good Hope staff picked us up in a military truck to take us along a dirt road to the zip lines. We were given helmets and gloves and got strapped in. After a brief cardiac episode (nearly), I really had fun gliding through the forest. I don’t regret it for a second. 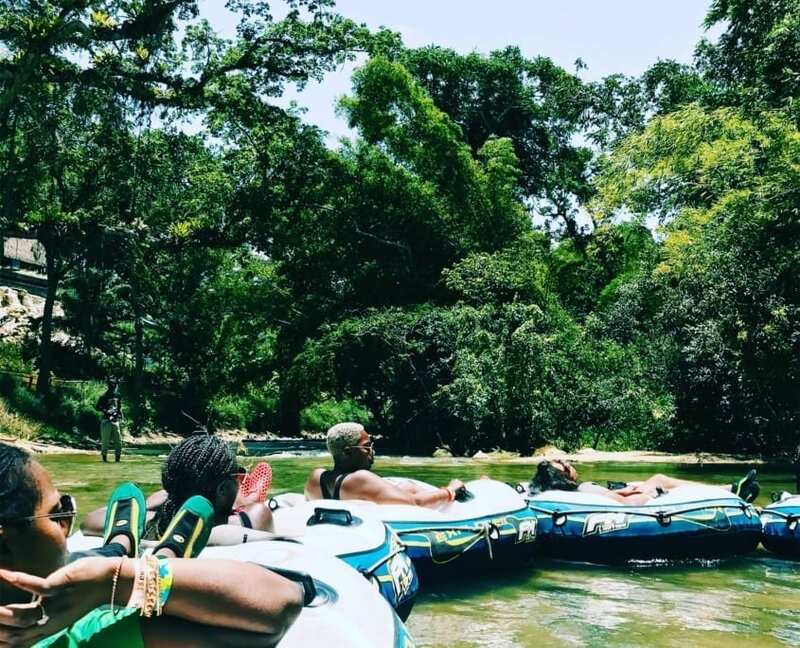 While tubing down the river, our guide stopped for us to swim and play in the cool waters from the Jamaican mountains. The staff told us jokes and stories of the historic monuments along the way. We learned of the oldest bridge in Jamaica that was built by slaves over 300 years ago. After our activities, we retired to the open bar, pool, waterfall, and water slide. The unlimited Jamaican Rum Punch and Red Stripe Beer was a lovely way to cap the evening. 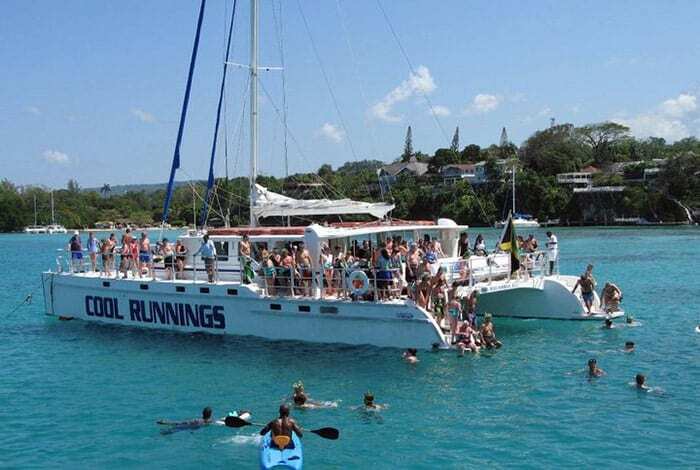 On our second day, we continued the adventure with the Good Ultimate Thrill Seekers, which includes the Catamaran Cruise, Dunn’s River Falls zip lining, and snorkeling. The driver picked us up from the villa at 9 a.m. and took us to the Ocho Rios Pier, where we got our wristbands and waited for the cruise ship. Aboard the Catamaran, we were served water and fruit punch. The staff then introduced themselves and informed us of the schedule for the four- to five-hour cruise. Before leaving the dock, the DJ turned the music on and the crew introduced themselves. We were given life jackets based on our swimming skills, as well as a snorkeling mask and flippers. The water was about 13 feet deep with an amazing view of the coral and fish. This was my first time snorkeling and I loved every minute of it. We also got to do a bit of surfing, which was more relaxing than I anticipated. 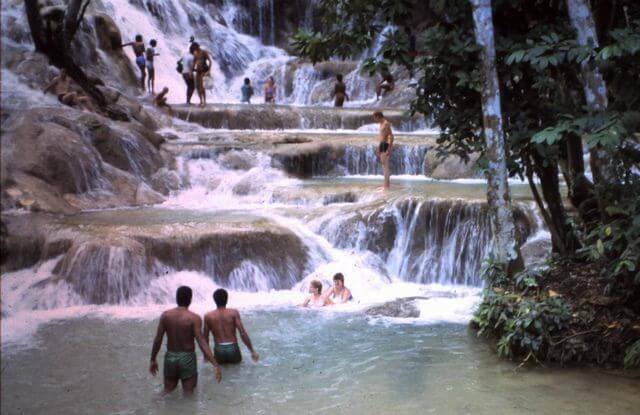 At Dunn’s River Falls, the choices were to either climb the falls or climb the falls and then zip line over them. We wore our water shoes, as recommended. The water is refreshing and gives you a great, low-impact workout as it pushes gently against your body. We made friends with the other families in the group and the guides were wonderful, as always. I wasn’t scared to do the zip line this time, and the views with my eyes open were unbelievable. The staff members were all friendly and professional, though they don’t shy away from asking for tips at the end of the excursions. The cost can really add up, so I recommend spreading the gratuity out or tipping those who gave exemplary service. Based on our cumulative experiences over several years, I can confidently conclude that staying in a villa is a far more authentic and rejuvenating experience than any resort is equipped to provide. It would take a novel to describe each feature that makes villas so outstanding, but I’ll just say the staff-to-guest ratio and customized service is unparalleled in my book. As far as which villa to choose, I would recommend Villa Serenity to anyone looking to enjoy the best of what Ocho Rios has to offer. 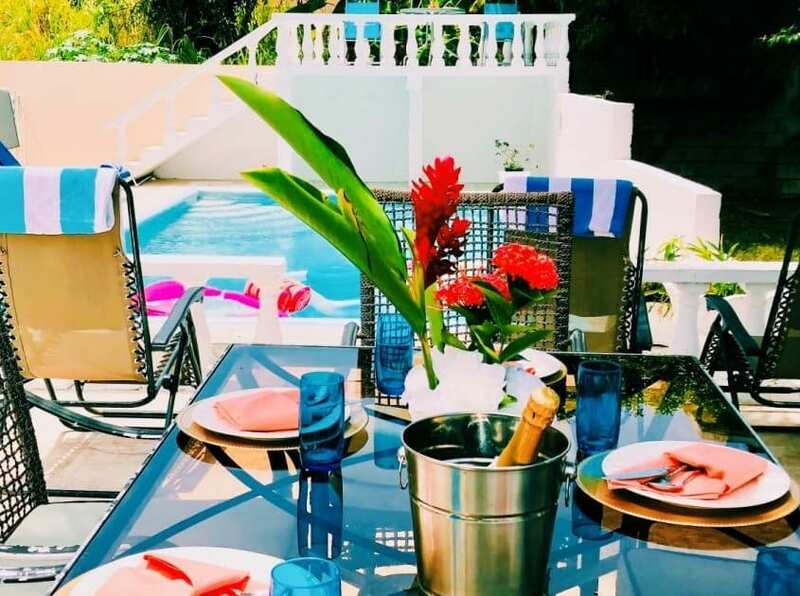 The luxury accommodations, personal staff, private amenities and easy access to the island’s attractions and beaches make this villa a grade above any resort or hotel and a serious contender among the villas of Jamaica.